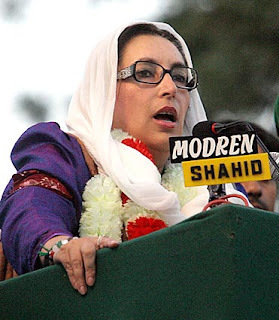 The assassination of Benazir Bhutto, the first Muslim woman to lead a Muslim country, is a serious blow to Pakistan’s prospects for democracy and, indeed, its viability as a state. As chaos and confusion set in, we should not lose sight of President Pervez Musharraf’s partial responsibility for this turn of events. At the very least, he cannot be absolved from his government’s failure to provide Bhutto with adequate security. Instead, Bhutto had to pay with her life for courageously challenging extremists of all stripes -- from al-Qaeda and Taliban to the country’s religious political parties and military hardliners. As heir to Zulfikar Ali Bhutto, the legendary democratic leader who was hanged by Gen. Muhammad Zia-ul-Haq’s government in 1979, Benazir emerged as a symbol of resistance at a young age -- but languished in jails and exile in the 1980s. Z. A. Bhutto’s legacy was empowerment of the impoverished and defense of ordinary people’s rights amid feudalistic politics and military rule. Rather than bowing to the military junta, he embraced the gallows. Hours before his hanging, Benazir was allowed to see her father for the last time, writing in her autobiography: “I told him on my oath in his death cell, I would carry on his work.” She largely lived up to the promise. Her first stint as prime minister (1988-90) was brief and disorganized. Lt. Gen. Hamid Gul, the former Inter-Services Intelligence (ISI) chief, confirmed that he sponsored an alliance of right-wing political parties to stop her from getting a parliamentary majority. Information about Pakistan’s nuclear program and ISI operations in Afghanistan were out of her domain. After almost a decade in self-imposed exile, Bhuto’s return to Pakistan in October gave her a fresh political start. Pakistan had changed, as military dictatorship and religious extremism in the north played havoc with the fabric of society. A tentative arrangement with Musharraf, together with Western support -- particularly from the United Kingdom and the United States -- eased her return, which hundreds of thousands of people welcomed, though terrorists greeted her with a string of suicide bombings. Bhutto’s contacts with Musharraf’s military government drew criticism, but she remained adamant that a return to democracy was possible only through a transition in which Musharraf would give up his military post, become a civilian head of state, and conduct free and fair elections. To the dismay of some democratic forces, Bhutto stayed the course even after Musharraf imposed emergency rule on Nov. 3 and removed the country’s top judges to ensure his re-election. Indeed, she even persuaded other important political leaders to participate in the planned Jan. 8 election, which she viewed as an opportunity to challenge religious extremist forces in the public square. She seized that opportunity by bravely traveling throughout the country, despite serious threats to her life, arguing for a democratic and pluralistic Pakistan. One can understand why religious extremists like Al-Qaeda and Taliban would target her, and the government claims that it is impossible to defend against a suicide attack. But Bhutto was reportedly killed by a sharp shooter before the terrorist blew himself up. So in the eyes of Pakistan’s people and especially of Bhutto’s supporters, the intelligence services, either alone or in collaboration with extremists, finally decided to eliminate her. Whether or not the government was involved, the fact remains that Pakistan has lost a desperately needed leader. With Pakistan’s future in the balance, the West’s help and support will be crucial, but that means recognizing that Musharraf is not the only leader who can resolve Pakistan’s myriad problems and manage the war on terror. On the contrary, by nurturing the current environment of instability and uncertainty, Musharraf himself must be regarded as one of Pakistan’s biggest problems. It is indeed very sad. At the moment I am in Karachi the whole city is plunge into chaos and a fear of un-known. May peace prevail in Pakistan! Its unfortunate and said incident, however there are few unanswered question. She kept voicing her concern about security all the time, and at the same time she was exposing herself to the terrorist and exteremist as an open target, was she just so naive to think herself as invincible. Even Bush the most powerfull man of this time would and cannot afford to do this even in the United States. With all due respect, We do have to partially blame herself for this and the aftermath where thausends of the innocent Pakistanis get killed, burned, lost all their meager belongings. Who will help these poor Pakistanis, Perhaps no one. Bhutto and family is all set may be another Bhutto will be elevated to the next chair of the PPP. The king has died, long live the monarchy. But how about he hundreds and thousand of the poor Pakistanis burned alive by the People Party's mob. Those who lost all their belongings are now on the road aftermath of Bhutto's killing. Who will compensate them? There is not even a single discussion about those unknown victims. Inquiry about who killed Bhutto is on its way. How about the Inquiry of those who reached havoc and killed hundreds of not thousand, How about FBI(US) investigating these heinous crimes inflicted on the poor Pakistanis. On one hand every one is crying about one Bhutto being killed, but not about thousands killed and lost their lifetime belongings. This is a shame . Ah yes, Bhutto's past sins are forgiven or just ignored now that she has given her life for her Pakistan. Really? Those that she ignored and were killed or lost their homes and livelyhood won't forget, nor forgive. She is of better use to her Pakistan now. Let the fire and the knives sort things out so that the people of Pakistan and the world can see just who is the enemies of the people and who will step forward to stop the freefall that Pakistan is now in. It may not be the U.S. Certainly not the U.N. nor the EU. It better be decided and stabilized soon, The U.S. Special forces and Rangers will not let Pakistan's nukes fall into the wrong hands. They will destroy them all first.